You can’t really go wrong with a butterfly theme when it’s for girls. It is easy to buy a gift, wrap it up and give it to the,. But if you have the patience to make your own butterfly cutouts, then you can give a much more personal and handmade gift. A butterfly mobile makes a beautiful gift for those cute toddler girls. You can use a mobile for bassinet and as wall mounted nursery mobiles. 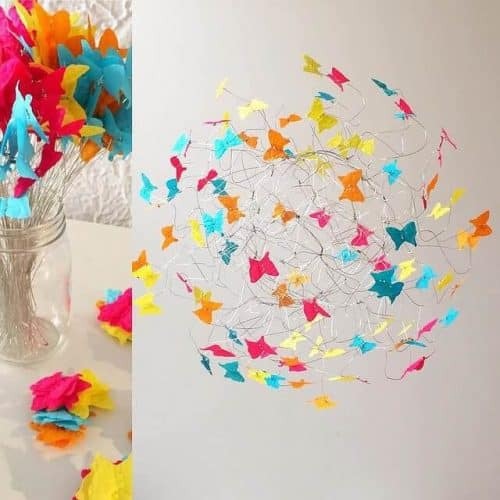 You can hang these butterfly mobiles over a crib or bassinet. A mobile for a bassinet has to be smaller and softer. You can place these mobiles in a cute pink bassinet. There are different types of bassinets out there. You can take a look at bassinets from Badger Basket, kolcraft, Eddie Bauer Bridgette etc. Some of these amazing ones play music to keep your baby pacified. Along with this, they come with a lot of comfort, fashion and convenience.